Medical doctors are not the only ones with bad handwriting. If you've studied any languages that use a non-roman script, then you may have had your own handwriting let-downs. You look at the perfectly printed letters in a critical edition or the breathtaking artistry of a scribe in a particularly nice manuscript, and then you go to scribble down a line or two of your own and it looks like -- well, scribbles. What if we saw learning to write well as part of the process of acquiring an ancient language? What if we saw it as a way of more fully appreciating the language and perhaps gaining a better understanding of the ancient scribes who copied all of this wonderful stuff for us? 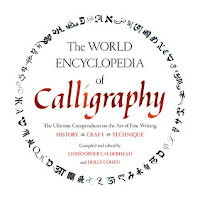 If this is something that interests you, then you might check out The World Encyclopedia of Calligraphy: the Ultimate Compendium on the Art of Fine Writing. It is an attractive volume with lots of colour photographs. 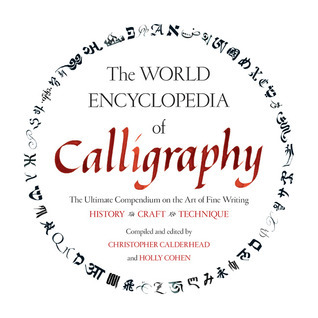 It offers some introductory information on the art of calligraphy before going into detail on some of the world's most interesting calligraphic traditions. These include: Roman scripts, Cyrilic, Arabic, Indic scripts, Tibetan, Chinese, Japanese, and Korean. For those who study classics and the Judeo-Christian traditions you might be particularly interested in the sections on: Greek, Ashkenazi Hebrew, Sephardi Hebrew, Dead Sea Scroll Hebrew, Syriac, Georgian, and Armenian. I picked up the book in a public library in order to learn how to write Ge'ez better. It does have a section on Ethiopic, although it is quite short (2 pages). I did learn, however, that to write good Ge'ez your pen angle needs to be anywhere from perfectly flat to 10 degrees, a helpful little tip. If you come across other resources that might be helpful for those wishing to improve their writing of ancient or medieval scripts, please post them in the comment section below! Learn World Calligraphy is a title that come up in my searches, but I have not gotten my hands on it yet. Nice post.Thank you so much for sharing this information.